Happy Sunday, spring is in full bloom here in Arizona. I am surrounded by the smell of Orange blossoms while hearing the bee’s buzzing about. Are you thinking about spring cleaning? Spending time with your children and family during spring break? I love your comments! Have a wonderful week and in case spring flowers are not in bloom outside your window, enjoy mine. You can bee organized and I’m here to help. A question that keeps popping up is how to contain the toys in the living room? An answer is a piece of furniture that has closed storage. That might be your accent table with a basket below or a storage ottoman if you have room. Don’t allow you living room to become the toy room. Limit the amount of toys allowed there at any time. There is no reason you can’t have your kids store their toys in their room or their playroom. They can bring toys into the living room and then take them back when they are done with them. Or you put them in a tote or basket and put them away. Another thing I find frequently is kids have too many toy options. Limit their options. Try rotating their toys. Let them choose say 10 to play with and you put the rest in a tote. If you do this say every month your kids will feel like they are getting new toys without you spending any money. Plus you limit the amount of clutter. Kids don’t play with all their toys. Think about when you go to grandma’s house. She has limited toys and they play just fine with those. I see lots of stuff you buy your kids when you are shopping as a bribe to “be good.” Stop doing this! You are wasting money and adding lots of clutter to your life. While they may scream and carry on that they want a toy in the store how long does that toy entertain them after you get it home? Right there is no need for this. Just say no. Your kids have trained you that every time they go with you they get a toy. Guess what you are not doing them or you any favors. So you buy them a cheap toy that is cheaply made. It breaks soon after they bring it home. Another melt down that it is broken. I bet if you added up all the money you have spent on cheap toys you would be able to pay a sitter. Just like don’t shop when you are hungry don’t take your kids when they are hungry or tired. Give them a snack before. Take something with you to keep your child engaged. Younger kids need one of their toys or a book. Older kids can help you shop. One of her tips is to Indulge in Grocery Store Fantasy – Good for when the “I wants” come up. You ask questions like: “OK, if the grocery store only carried three things, what do you wish they were?” “What if we could only eat candy? Wouldn’t that be funny? What would you eat for breakfast?” Of course you are not going to let them eat marshmallows with chocolate for breakfast but it is a fun game. Another parent suggested that her kids love to guess how much fruits and vegetables weigh and then put them on the scale. As a result they eat more fruits and vegetables. Now in most places you can do your grocery shopping online. You know that must be something that was invented by a mom, to which we say thank you. What are your tips for living and shopping with kids. Every since the first telephone call people have been using the telephone to reach out and touch someone. Many of those calls are welcome, but more often than not they are unwelcome, uninvited and very bothersome. In the U.S. we have the DO NOT CALL LIST. I have been registered on this list for years. I’m guessing you are too. But alas that has not stopped the calls for me. I have tried blocking the numbers with no success. I have tried call blockers and have paid for this app or that app and frankly the callers always seem to find a way around it. Now I’m getting text messages and voice mail and my phone did not even ring! Yes it’s frustrating. I pay for my phone as I’m sure you do too. Why should I have to pay for calls I don’t want, need and I specifically requested that my phone numbers not be used for this purpose. So like you I absolutely wanted to find a viable solution. First, if you have not registered your phone numbers with the Federal Do Not Call Registry do so immediately. By the way, once you have registered your numbers you don’t have to renew it. You can register cell phones at the same time and place. Yes, I heard the rumors about having to renew, but as of March 2019 that is not true. Recent estimates that the number of robocalls increased by 57% in 2018, to nearly 50 billion calls. (Yes, that is not a typo… BILLION.) The FCC says that robocallers are the number one thing that consumers complain to them about, with over 200,000 robocall complaints per year, constituting about 60% of all the complaints they receive from consumers. And unfortunately, it’s expected that this year, as many as half of all cell phone calls will be robocalls! So, with robo callers there are 2 trains of thought..
Don’t answer and don’t call back. Answering a robocall or returning the call indicates to a scammer that they have reached a working number and potential target. Put your number on the FTC’s National Do Not Call Registry. Adding yourself to this database is free and your registration never expires, but doing this alone is unlikely to stop all automated calls. Download a call-blocking app. Nomorobo and Hiya are among the hundreds of applications that monitor and block phone numbers used by robodialers. Call your phone company. Ask what tools or products they offer to block scam calls. The FCC keeps a handy list. File a complaint to the FTC and FCC. The agencies use unwanted-call data to track trends and bring enforcement actions. Or 2. Maybe you should make them pay? Which ever way you choose to deal with the annoying robocalls I wish you luck. I’m actually looking forward to the process. I always enjoy seeing your comments. Raise your hand if you get unwanted calls. I’m interested in the number of unwanted phone calls you get on a daily basis. I get them too. There may be something else that we can do about it. I’m also doing research on the subject. I am looking into some very interesting stuff. I’ll be posting my results. So it’s time. You have talked about this and you are all in agreement you have to move yourself or your senior family member into a smaller possibly senior housing. I know you are both looking forward to the day and a bit nervous. Not to fear I want to share some of the best tips to make your move in day the best it can be. Check with the facility for its recommended packing list and exact space measurements. Find out what items are already provided in every resident’s space, so you don’t bring duplicates. Be sure to ask whether there are rules against anything — it’s not uncommon for communities to prohibit coffeemakers or even expensive jewelry collections. Also note that most communities recommend labeling every item (including clothes) with the owner’s name. But how are you or your mom going to make it in 400 square feet? Remember that the living residence itself, and the size of the room, suite or apartment is not the most important thing in any senior living residence, including assisted living, memory care or skilled nursing. If the “stuff” will fit and the adult child and their mom or dad is happy with the space available, then the actual size doesn’t matter! It’s how the space is arranged and what quality of care is delivered that really matters. However, that being said this is a few things to keep in mind. Also, think comfort for class clothes and shoes. Perfect examples are solid tanks, comfortable flats, and a comfy pair of pants. Mix and match will be your friend. Remember that scarves can really change an outfit. You will not need lots of dressy outfits. Think a basic little black dress with a jacket and dressy slacks outfit and shoes for more formal affairs. If you are going to an area where it gets chilly you will need a light jacket. Heavy coat, mittens, hat, and scarf *(if you’re going to be in a colder climate) Maybe rain boots and an umbrella. Don’t forget a comfy pair of slippers. Remember your entire space will be small. So don’t bring lots of shoes. No more than 6. But you can plan on one each: flats, dressy low heel, sneakers, slippers. It’s hard but really you will not wear every shoe in your home closet and more importantly, you don’t have room for them all. Whatever you think you need edit out 40% of it. Oh, by the way, if you are sharing a bathroom you might not be able to leave your stuff in the bathroom. You will have to carry it from your room to the bathroom and back again. Bring your own shower supplies. You’ll want a small bag or carryall that is easy to hang up where you can reach your soap, shampoo, and conditioner. What should you bring with you if you are sharing a bathroom? The shower gel is really easier than bar soap. You may be doing your own. So you will need to bring your own laundry detergent, softener, stain remover and quarters. You will need a laundry basket or bag to get your stuff to the laundry. Most landlords do not allow you to put holes in the walls so no nails. You may not need an alarm clock if you use your phone. Your phone can be your camera, calculator, calendar and address book. This is not by any means a complete list if you want more tips on what to bring check with the facility. Good Luck and cherish every moment. 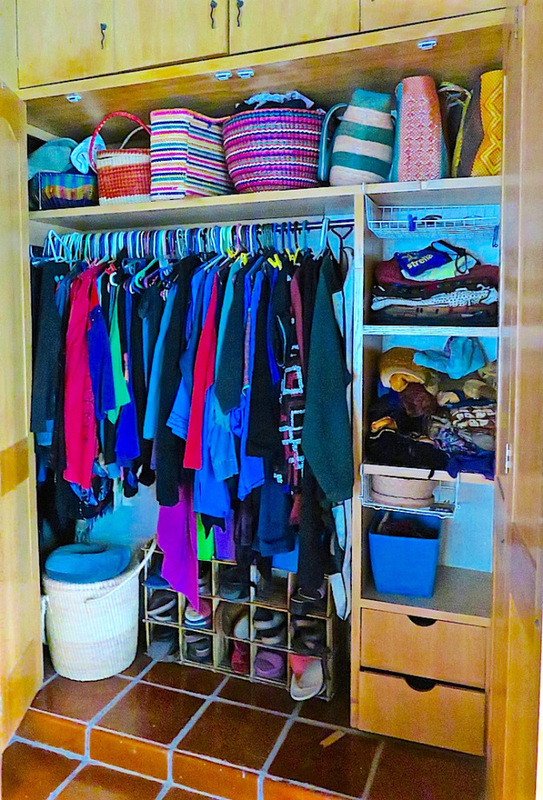 Today seems like a good day to blow the whistle on your clutter.